One of the most innovative and productive Barcode Generator, Barcode Labeler, Barcoe Maker, Barcode design and Barcode print software, the best barcode software available. SmartCodeStudio is the industry-leading barcode label design, barcode generator, Barcode Labeler, Barcoe Maker, and Barcode printing software. It is feature rich and yet extremely easy to use. It has comprehensive database support, powerful design capabilities, flexible database integration, extensive barcode support and a highly intuitive user interface. 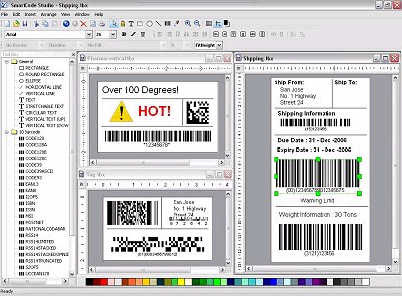 SmartCodeStudio is one of the most innovative and productive barcode label design and barcode print software available. It is currently being used by many Fortune 500 companies around the world including hospitals, universities, manufacturers, retailers, municipalities, and government institutions in many different countries around the world. Metric and US Measurement Systems. Print Studio Standard Edition - print label, shipping mailing barcode label printing software! PDF Password Remover - decrypt protected Adobe Acrobat PDF files. HDD Regenerator - regenerates HDD ( Hard Disk Drives ) exclusively at physical level. Hot!